A classic Shaker-style kitchen with a painted woodgrain-effect finish, available in a range of natural colours. If you would like to enquire about this kitchen give us a call on 0141 465 64810131 322 304701224 502 85101382 339 92901383 431 88701324 578 69701563 501 50901506 896 28701324 578 69701738 479 72401292 501 4710141 370 37000147 578 937501355 587 62801236 793 84001236 793 84101698 479 7230141 370 37010141 370 370201236 793 8420141 370 370301389 717 3070141 370 3704, 8am to 10pm, 7 days a week. All our kitchens come with free expert fitting by experienced professionals. 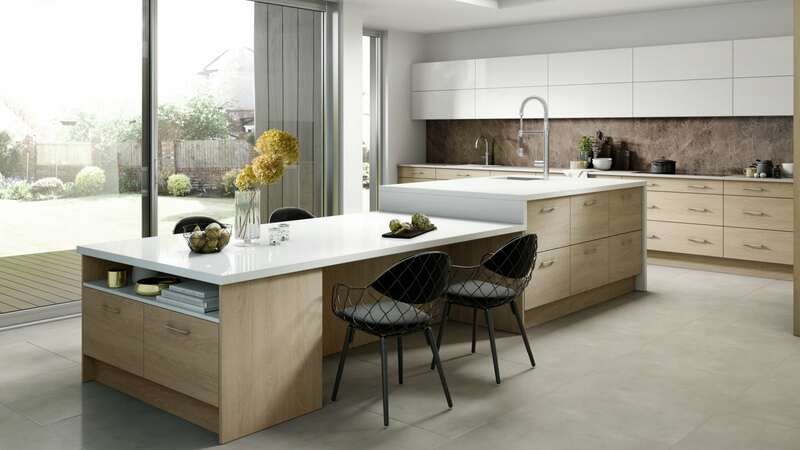 Established in 1988 we are Scottish company that specialises in complete kitchen refurbishments. We can take a drab and dated kitchen and renovate your whole room to a showroom finish, in a shorter time and at a better price than anyone, guaranteed! We have renovated thousands of kitchens over the years so we know how to get the job done quickly and correctly. Standard 15 year Guarantee included on all products and installations. We have a over 100 5 star reviews from very happy and satisfied customers. Click below and view them.